WordPress runs over 30% of internet, and it shows no sign of slowing. People list it as a job skill on resumes, WordPress Professional is now a job listing, and it’s used by the technical and non-technical to have a quality online presence. Blogs, news sites, ecommerce stores, portfolios, even full web apps are using WordPress these days. Whether you are looking to learn WordPress for the very first time, or if you’re a veteran who wants some refresher WordPress training, we’ve curated some of the top WordPress classes and resources that you can use to hit the ground running. Lynda.com (now LinkedIn Learning) is one of the best online learning spots around, and that’s no different when it comes to how to learn WordPress. While there are many courses on the platform by wonderful teachers, the ones by Morten Rand-Hendriksen are some of the top. He takes you step-by-step through his WordPress classes, and by the end, you will have a real grasp on what the CMS is capable of. Morten was involved heavily in the creation of the new WordPress editor released on 5.0, so you know he knows his stuff. In terms of teaching style, Morten is not one of the rapid-fire talking heads. Instead he breaks things down to their constituent pieces and takes advantage of the platform to make sure you comprehend the material. And if you never thought about WP child themes like playing with Legos, you will after this. Whether you’re just beginning or coming to WP with a lot of background, Lynda/LinkedIn Learning has some of the best tutorials around. While it is a subscription service, you can work with a free trial, and many public libraries have a subscription that patrons can use on-site. So that eliminates the cost for you, which may be the biggest barrier for some. Team Treehouse offers WordPress classes online like many others, but where they differ is that they designed their platform to accomodate in-sync coding and interaction. They want you to be as hands-on as possible, which happens less often than it should with online courses. But if you want to learn WordPress, you need to get your hands dirty, figuratively speaking. In general, Treehouse’s WP courses are broken down into tracks, and each of them is labeled as either beginner, intermediate, expert, or so on. You get quizzes to make sure you comprehend the material, and they have apps that you can use that are fully functional for on-the-go learning. This is top-tier WordPress training, and their instructors are amazing. Zac Gordon, specifically, has made a name for himself in WordPress training circles, and he does not disappoint here, either. You can easily grasp what he’s talking about because he presents the topics and individual lessons logically and straigthforward. The UI is also spiffy, and it’s hard to get lost. The community forums are incredibly helpful, and if you have a question about a lesson, either the student or instructor will respond to help. It’s pretty useful. As their name says, if you’re a WP beginner, the content here is for you. They cover topics that almost everyone can benefit from, but they cater to simple and easily implemented solutions that don’t require a lot of code. So if you Google how do I do this and that with WordPress, one of the results will probably be a plugin that WPBeginner found that can do the job well…for beginners. Veteran WP users may not get as much out of this resource, but that’s okay. They’re not the target demo. The blog is totally free, and they offer videos, guides, regular content with lots of links, and tons of resources. The only real catch is that their video content is behind a members wall. You don’t have to pay, only give them your email address. Which seems fair, given the quality of the tools you can use to learn WordPress with. WP Apprentice can really take you from Zero to Hero in no time flat. If you’re not technical, no worries. They have a quick-start course you can access for free, essentials, and various courses that go down as deep as SEO marketing and ecommerce website blueprints. WP Apprentice wants you to succeed. This is absolutely not an advanced resource to learn WordPress. It is, however, a great option for people who want to know what in the world WordPress is and does without a lot of jargon or extraneous information. The WordPress classes can get into more intermediate topics like theme mechanics and how they work under the hood, but you’re not generally going to be diving into the Core files and editing PHP. Most of the resources deal with the WP software that you see and walks you through it in such a way that you can even be comfortable taking notes without having to pause the video over and over again. Just like a 101 course at a university, WP 101 offers classes for you to take that break down the fundamentals of the platform so that you can be sure that you are learning WordPress in exactly the right way. As a premium service, the WP 101 plan is affordably priced: just $49 per year. In fact, this is a resource that developers and designers could use to send their clients to. Most people have handed off sites to clients who call with very basic questions because they’ve never used the platform before. This is ideal for people who need the basics in WordPress training. They’re not the slowest videos, either. They are paced well, but are easy to understand. In fact, they have a plugin available so that you can send the videos to your clients through your own subscription. Even the intermediate courses are over topics like RSS and permalink functionality, so you won’t learn how to make WordPress sites here, but you will absolutely learn how to use them from the backend. If you’re coming from a platform like Blogger or hosted website service and are a bit overwhelmed by what WP has to offer, head over to WP 101. You will be creating content in no time. WordCamps are amazing conferences put on by Automattic and the WordPress community. Hundreds of talks and lessons are given each year across the world, and they’re all recorded. And made available for you here. From WordCamp Europe, WCUS, or the Camp in a small down halfway across the globe, you can learn from the best and brightest WordPress Professionals just like you were in the room with them. 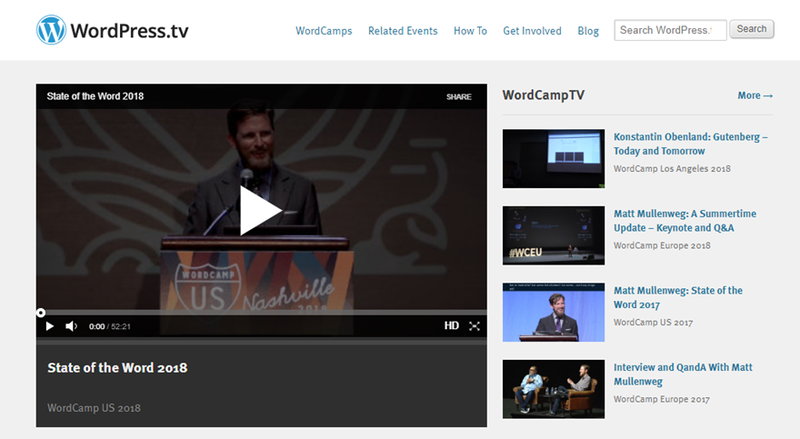 Somtimes, there are even livestreams of the events on WordPress.tv where you can tune in and see the interaction as it happens. It’s not quite like being there, but it’s the next best thing. Also, because each and every conference session is recorded and posted, it’s not nearly as big a deal to pick which panel to attend when you are at a WordCamp. Whatever rooms you miss are going to be posted up soon, so you won’t miss out on anything at all. Ever. The content at WordCamps vary from place to place, but generally there are design tracks, beginner tracks, advanced development tracks, business tracks…lots of things. So everyone can find something for their skill level here. You probably know iThemes because of their awesome plugins. iThemes Security and BackupBuddy, specifically. They also provide WordPress training for folks, and their webinars knock it out of the park. And by it, we mean your WordPress knowledge. If you’re a designer, they have stuff for you. If you’re a developer, you’re in luck. Are you a marketer and need SEO help? They have you covered there, too. The webinars are interactive and live, which differs from platforms like LinkedIn Learning and Treehouse. Instead of recorded lessons and support forums, you get direct feedback from the instructors and presenters right then and there. That’s what makes the iThemes Training so special. Now, on the other hand, you might get frustrated if you watch of the sessions that’s recorded at a later date because the presenter will be interacting iwth folks through the live chat, which you also have to follow. It’s included, thankfully. That nitpick aside, the iThemes Training folks know their stuff and strive to make sure the content they’re putting out is top-tier. Oh, and did we mention they’re free? Well, they’re all free. Just sign up and show up. Easy peasey. WP Sessions updates their content on a monthly basis, and their content tends to be skewed more toward the intermediate developer than total beginner. How to create your first plugin and using WP-CLI and the command line are not topics that you tackle with your first installation, but they are topics that you will want to learn as you dive deeper into the WordPress platform. The content that comes monthly feels a lot like conference presentations, and some of the most beneficial professional development comes from that kind of panel. For just $15 per month, you can access their archives and check out what’s constantly being added. Podcasts are awesome. WordPress is awesome. That means that WP the Podcast has to be awesome, too. Well, outside of that terrible logic that just doesn’t work, WP the Podcast really is a great resource to learn WordPress or to just brush up on particular topics. Whether you sit and listen actively or let it play while you do housework, drive, or exercise, you will pick up lots of nuggets as you hear the speakers discuss the plugins they love, the pitfalls they’ve fallen into over the years, or whatever else may be worth mentioning. The episodes come out regularly and the hosts, David Blackmon and Tim Strifler, know their stuff when it comes to WordPress. They’ve worked in the field long enough that we all probably have something we could learn from them. So hit the subscribe button and get those headphones on. 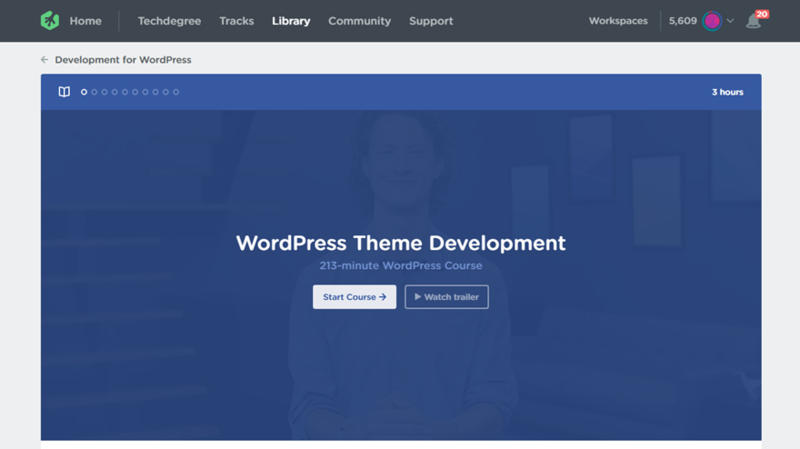 Udemy has a lot of WordPress content. This platform works a lot like Lynda or Treehouse, except that anyone can create their own course here. While that can be dangerous to an extent, the reviews tend to keep the true gems up top so we can all see them shine. If you’re a beginner, there are tons of courses for you. Same for advanced developers wanting to get that extra bit of performance out of their code. And as WordPress updates, most teachers update their courses, too. You can check the reviews to see which instructors do this so you know where to spend your money. The platform itself is intuitive, and you won’t feel overwhelmed as you watch the course material. And while the courses may seem expensive at times, Udemy often runs sales that are up to 70-90% off the entire site. I have personally snagged courses that retail for hundreds of dollars for a fiver. That means that you won’t be out a lot if you find that the teacher isn’t your style. 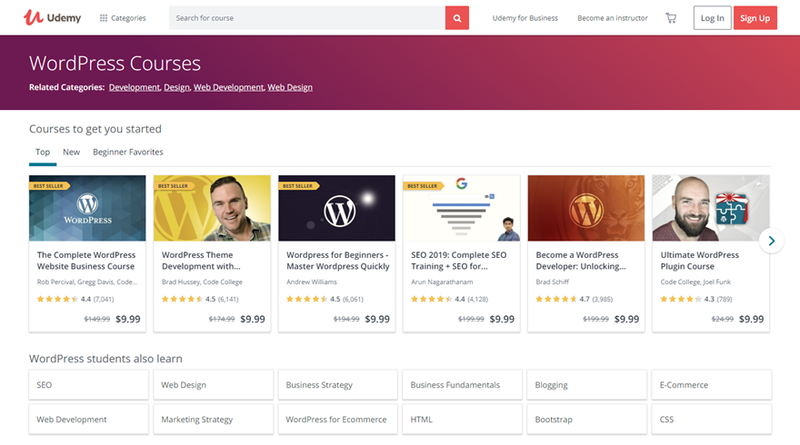 While the open platform can be scary to invest in, the content that you can find on Udemy is so wide-ranging that it’s worth looking through to see if there’s something you can learn. Because there is. The sheer number of WordPress classes here prove that. I tend to think of Smashing Magazine as The Atlantic of the tech space. The articles are thought-provoking, and the editorial quality is through-the-roof. They run their own conference, host a job board, and put out premium and free content that breaks down the topic better than some instructors I had in college. Their WordPress content is some of their best work, if you ask me. But I may be biased, working in WordPress and all. Sometimes they post a think-piece on what we can learn from a snafu that happened during Gutenberg development. While others, they give a step-by-step breakdown of how to use the WP-REST API to run the backend of your mobile app. It can vary day to day, but their WordPress training is some of the most consistent out there. Rarely does it rehash content that you’ve seen elsewhere, and the best part is that it’s all free. Smashing does offer books and ebooks on wider topics than WordPress than can be applied to the platform, however (UX, web design in general, digital adaptation, etc. ), and they’re all premium products. Conclusion? Learn WordPress Any Way You Want! Do you prefer free blogs? You can learn WordPress that way. Like step-by-step instruction? There are WordPress classes with that. Want to talk with your teacher live? Yep, once again, there’s WordPress training where you can do just that. And it’s all available, free or paid, just depending on where you look. So whether you’re new to WordPress or completely invested and just need a few refreshers, there is something out there for you. Now, get to clicking on those links above, sample what you can, and find out which ones of these work the best for you. And good luck! How did you learn WordPress? What can you share about your process? the WP Beginner blog has been instrumental in me learning WP. Great list. Thanks! I am with you on that. I have taken their advice more than once on how to fix problems. Something is up with the comment form. The submit comment button appears disabled, although the click event appears to work. This is a great list! I’ve been meaning to improve my wordpress skills through something like this. Another great post thanks @Keeton. 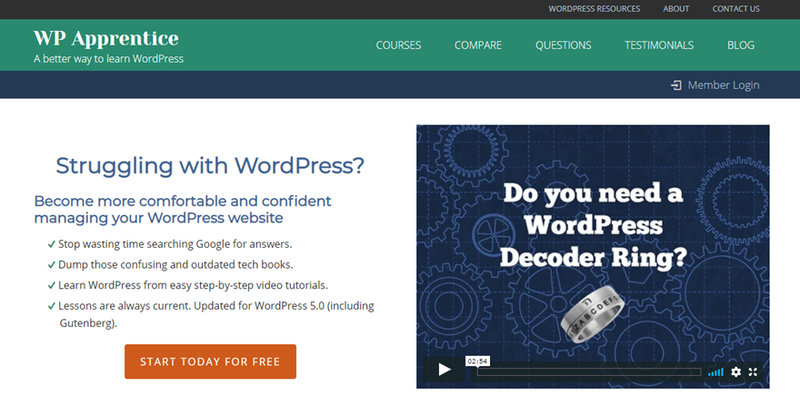 Becoming a WordPress developer by Brad Schiff on Udemy is one a great Wp course I’ve ever taken. if you are someone who new to WP with a little bit knowledge on HTML & CSS, then you should take this course will tremendously help you to understand PHP and the development environment of WP. Great list. I learn from Udemy, Alison, Coursera, FutureLearn, etc. The course is free. But you need to upgrade for certificate.